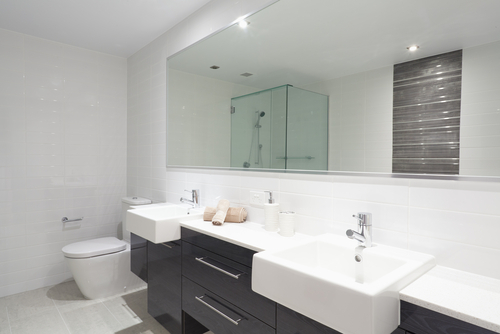 A bathroom is a very important component of any house. It is a place where people go to refresh themselves up. Although most people do not spend long hours in the bathroom, it is a room that needs to be very well maintained at all times. This not only means that you need to regularly clean the bathroom, but that every once in a while, you might need to renovate it. This is without doubt the most attention grabbing piece in the bathroom, and it should work to flatter the whole look of your bathroom. If you want to change the face of your bathroom, it would be a nice idea to start with the vanity. You could choose to change its color so that it matches with the walls of your bathroom. Also, you might consider having it enlarged so that you have more storage space, which is something that most bathrooms are in dire need of. Additionally, you could choose to change the whole vanity in favor of a better, water- resistant material, which makes your bathroom a lot better. Whatever you choose to do with the vanity, make sure that it will complement all the other parts of the bathroom, because it holds in it equal power to completely ruin the image of your bathroom. Moreover, if there is no mirror above your vanity, it would be a good idea for you to put one. Mirrors do wonders for the lighting of your bathroom, not to mention how functional they are. When it comes to the walls of your bedroom, there is simply no limit to the number of materials you can choose. Tiles are a favorite for most people and for good reason too, because they are easy to clean and are water resistant. If the walls of your bedroom have been feeling wet for a while, it is time you changed them as well as looked into possible plumbing problems that may be making them wet. In addition to having tiled walls of any color, preferably a light color, you might consider having wall murals on your bathroom walls. With these, you can literally have any background of your choice, which will make your experience at the bathroom far much enjoyable. The most common floors for bathrooms are Vinyl, tiles and even carpeted floors. All of these have their advantages and disadvantages, and mostly, it is a matter of personal preference. While carpeted bathroom floors are warmer and fluffy, you might have to contend with dampness in the bathroom because carpets are prone to absorbing water. Tiles on the other hand are easy to clean and hardy, but they can get very cold especially if they are not heated. Vinyl is a bit warner than tiles, and is easy to clean, but it is still not as comfortable as the carpeted floors. So depending on what you value the most in a shower, you can choose to change your current floor to any of these. Nothing spells luxury better than being able to fully stretch your whole body in a bathtub and just relax in the water. Over time however, these bathtubs can become dysfunctional for one reason or another, and this calls for a renovation. Although replacing a bathtub can be very expensive, it is worth the effort if you value your comfort. If you have a tight budget to stick to, you might consider having a quality second hand bathtub installed for you, and that way, you will cut down on cost. Showers are extremely important in any bathroom. They are in fact the most functional component of a bathroom, particularly because most times people don’t have much time to linger in a bathtub when they are running late for work. It is therefore advisable that you invest in a good shower, because chances are, it is the component of your bathroom that you will use the most. Make sure that your shower measures at least 4 by 6 feet, so that your experience will be a lot more enjoyable. It is important to keep the toilet in your bathroom in good shape at all times. Another rule of thumb when it comes to the toilet is that it needs to be hidden and discreet. To achieve this, you might consider building a half- wall to hide the toilet from view. Alternatively, you can have an armoire or dresser separate the toilet from the rest of the room, and you will achieve the same effect. They may appear to be the smallest components of your shower, but you should not underestimate the power they have of improving the overall look of your bathroom. If you install classic stainless steel faucets to replace the old taps at your sinks, the change can create a near magical effect. Make sure that you use durable material on your sinks. You might consider replacing porcelain with stainless steel or enamel on steel in order to have a more durable and beautiful sink. Towels are in great supply in any bathroom, and it is a good idea to have towel bars in your bathroom. You could get a bit more creative with this, and have the bars in the shape of a ladder, so that you have your towels displayed to everyone who enters the bathroom. Make a point to buy towels with the same color as the walls of your bathroom or your vanity, to bring some color consistency to the bathroom. 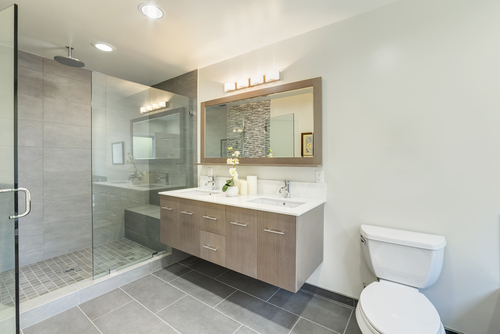 Renovating a bathroom can be fun and exciting, but making poor choices may be something you end up regretting for a long time. Choose to renovate your bathroom in a way that makes all the components blend well with each other, and you will always have a smile when you enter the room.